Freestyle sculpt in Mudbox from default sphere, took me 2 – 3 hours for the sculpting and another hour for texturing & lighting. This is a straight render from Mudbox with diffuse, spec and gloss maps. Light with HDR lightmap and a single direction light. I used both AO filters and tone mapping. Was about 2 million polys, my poor computer was struggling real bad by the end of it. If I was to take this piece further will have to retopo it for sure. 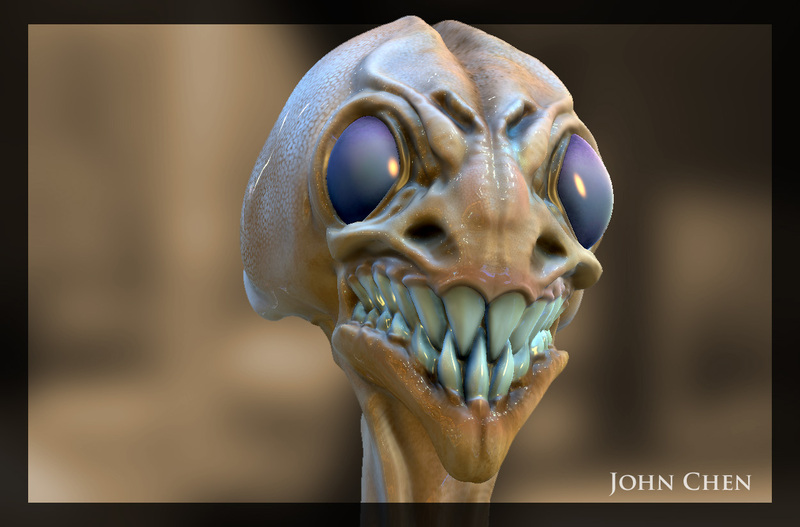 The creature design is based on concept sketches by Jordu Schell. PS: I am noob at MudBox too. Got this 2 days ago and I am feeling well after look some artwork as yours posted here. Thanks 🙂 yes, mudbox is a great program to use, in my opinion it is more user friendly than zbrush. But Zbrush has many more tools. Good luck!